Welcome to Integrity Works! SEE developed the Integrity Works! program to help schools build a culture of integrity and resist cheating in all of its forms. Each of the following text boxes are linked to resources that can be used in secondary schools to strengthen student and faculty commitment to character and specifically integrity. More information about the background, research and collaborators that created Integrity Works! View here the brief video to learn about SEE’s three-lesson ​teacher professional development seminar we call Achieving with Integrity (AwI). The seminar supports teaching strategies to develop student ethical functioning and prosocial character with a commitment to a life purpose of ethical action. ​Learn more about the seminar. Learn about​ the text Creating a Culture of Academic Integrity. The published "toolkit" provides school leaders and teachers strategies and tools that support the development of an ethical learning community​ and resist cheating in all its forms. Capture a baseline of data with the on-line Academic Motivation & Integrity Survey (AMIS). 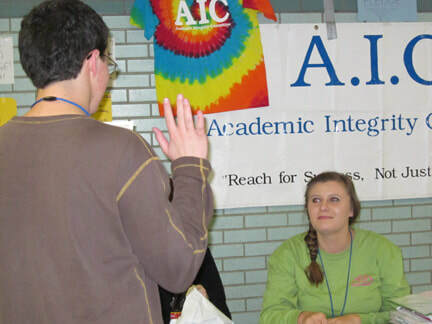 AMIS provides school leaders information and analysis of student perceptions, beliefs and behaviors related to academic integrity in their school. Investigate ​free resources to support an individual teacher or leadership team (including students) in the advocacy of academic integrity.